Looking for Draftsight training in ? Having not paid for the Draftsight software it might be tempting to not pay for training. A recently completed day of Draftsight training for a company based in Yorkshire produced delight amongst the trainees who wished that they had booked 2 days instead of just 1. That's because there's a lot more to using CAD software than most realise. Even just to do basic drawing or changes. With 2 days training topics can be covered on the first day, allowing time for practice on your CAD work during the second day. It also helps that we leave a summary of topics covered. This has manual page numbers, which makes for an easy and quick refresh after your course. 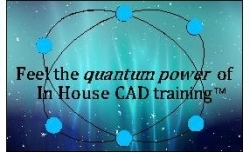 We suggest that our in house training, which would be focused on your Draftsight software, would be a better option than typical Autocad training courses. Indeed these are typically offered by company's whose main objective apart from training is to sell Autocad software. Another problem with attending an Autocad course is that you would have to set up templates in your Draftsight software on your own, when you get back to your office. Individual set up is necessary as different printers or plotters have varying page sizes. Not an impossible task, but much easier when assisted by an On-Site trainer. Many companies or organisations are unaware of the complexities of CAD software. So delegating the task to just one employee may not be the best solution as typically no-one will be able to take over the CAD work if that persons is away from work.